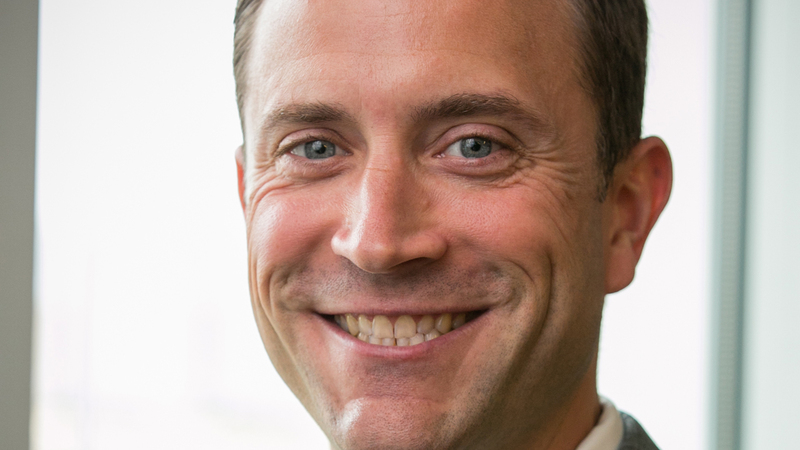 New AAR President and CEO Ian Jefferies has lots of reasons to smile, based on traffic levels so far this year. So far, 2019 is off to a strong start for Class I traffic volume. Association of American Railroads-compiled numbers for the week ended Jan. 19 show total U.S. rail traffic of 543,111 carloads and intermodal units, up 6.9% compared with the same 2018 week; 258,833 carloads, up 7.4%; and intermodal volume 284,278 containers and trailers, up 6.5%. North American (U.S.-Canada-Mexico) numbers rose, even though Mexican traffic, measured alone, declined. Eight of the 10 carload commodity groups posted an increase compared with the same week in 2018. They included coal, up 5,554 carloads, to 87,906; nonmetallic minerals, up 3,614 carloads, to 29,994; and petroleum and petroleum products, up 3,151 carloads, to 13,710. Commodity groups that posted decreases compared with the same week in 2018 were grain, down 415 carloads, to 22,913; and farm products excluding grain, and food, down 370 carloads, to 15,357. 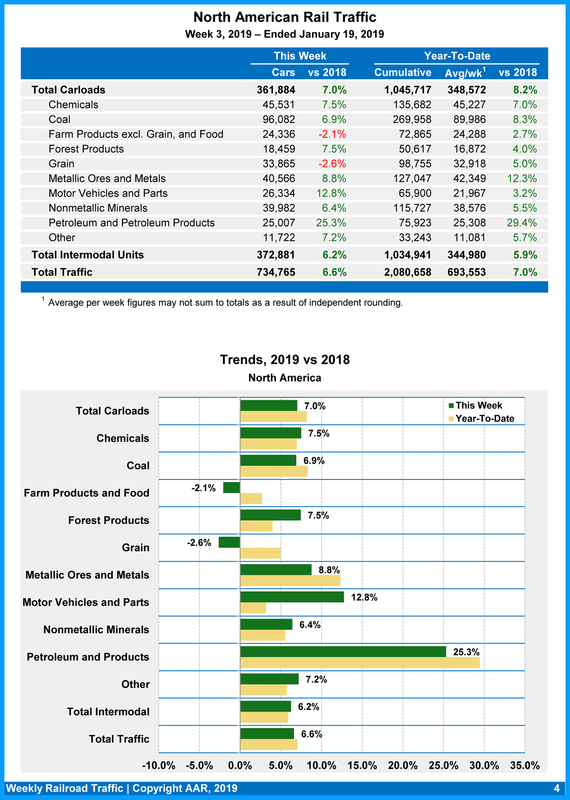 For the first three weeks of 2019, U.S. railroads reported cumulative volume of 746,832 carloads, up 8.1% from the same point last year; and 787,509 intermodal units, up 5.7% from last year. 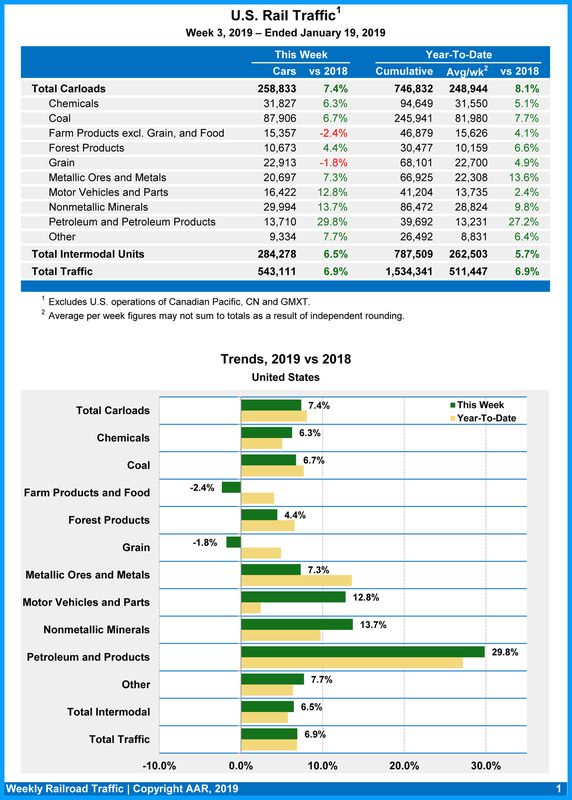 Total combined U.S. traffic for the first three weeks of 2019 was 1,534,341 carloads and intermodal units, an increase of 6.9% compared to last year. North American rail volume for the week ending January 19, 2019, on 12 reporting U.S., Canadian and Mexican railroads totaled 361,884 carloads, up 7% compared with the same week last year, and 372,881 intermodal units, up 6.2% compared with last year. Total combined weekly rail traffic in North America was 734,765 carloads and intermodal units, up 6.6%. North American rail volume for the first three weeks of 2019 was 2,080,658 carloads and intermodal units, up 7% compared with 2018. Canadian railroads reported 84,670 carloads for the week, up 10.6%, and 71,008 intermodal units, up 8.8% compared with the same week in 2018. 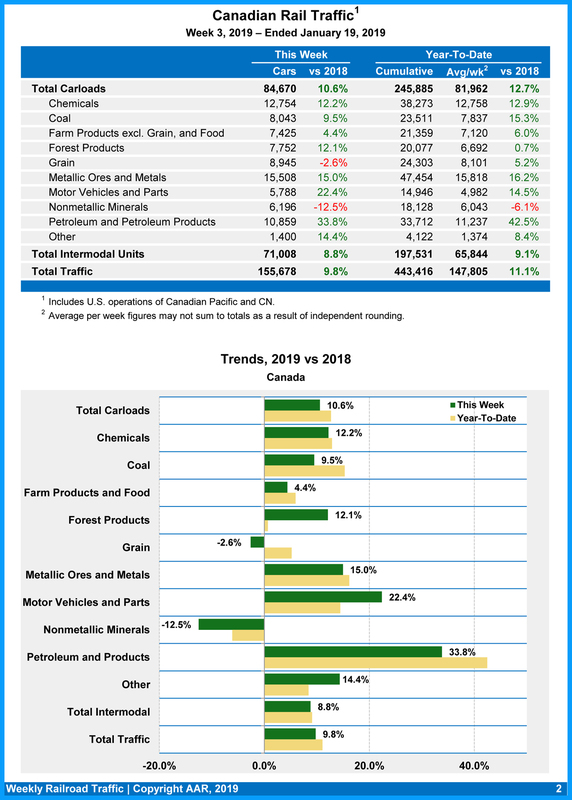 For the first three weeks of 2019, Canadian railroads reported cumulative rail traffic volume of 443,416 carloads, containers and trailers, up 11.1%. Mexican railroads reported 18,381 carloads for the week, down 10.7% compared with the same week last year, and 17,595 intermodal units, down 5.9%. 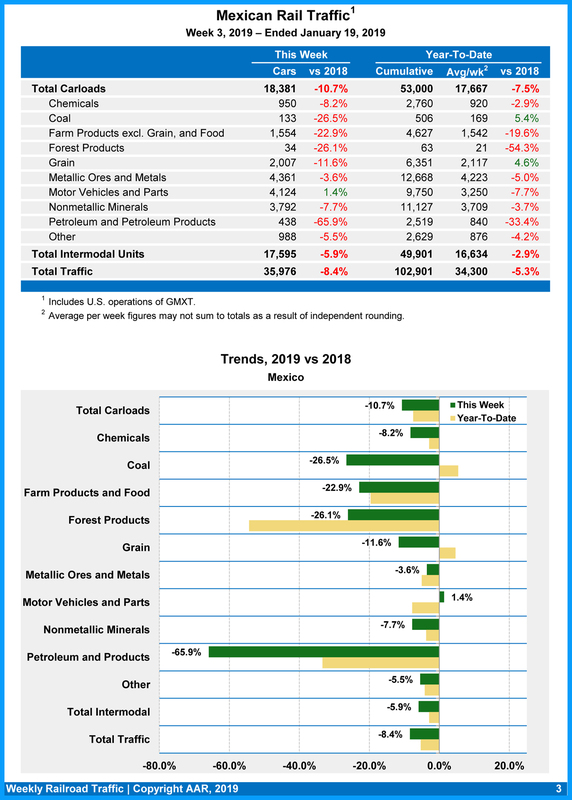 Cumulative volume on Mexican railroads for the first three weeks of 2019 was 102,901 carloads and intermodal containers and trailers, down 5.3% from the same point last year.